IS THIS A CICADAS? It really freaked us out!!! Thanks for the photo. Yes, that is definitely a cicada. 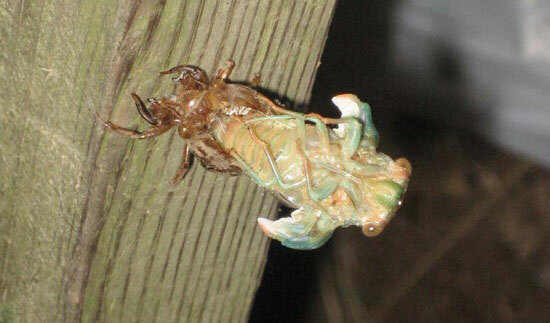 It can be a little unnerving when seeing a cicada going through the eclose (molting) process for the very first time. Consider yourself lucky. Most people go through life only hearing the males calling in the trees but never seeing them. It looks like you were up at the right time. This specimen is a male and I think it looks like either a Tibicen linnei cicada or Tibicen canicularis. I can't of course be 100% sure without seeing it after it completely hardens up. Right now it is only a "Teneral" a molting cicada that is really all soft and squishy. Interestingly, that night, there were lots of noises in the grass, and we thought we were seeing 'jumping frogs'. I think that there were more cicada around while we were having our campfire. Yes... I guess it is lucky of us... but, really we all thought that we were seeing an alien life-form! We didn't know if it was the adult beverages :)! Thanks so much for your help! I was so happy to get a response confirming our discovery.